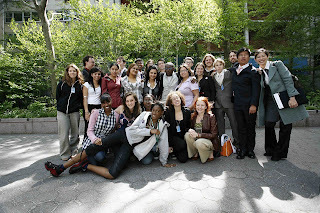 Lighthearted Locavore: New York City Youth Meet UN Youth Caucus! New York City Youth Meet UN Youth Caucus! Check out the post over on Sustainable Food Monitor about the Youth Farmers Market at Dag Hammerskjold Plaza yesterday (co-authored by Colin Flora). "A youthful, yet purposeful air filled the site of the weekly Wednesday Greenmarket between 1st and 2nd Ave at 47th St. Perhaps it was the Teen Iron Chefs from Urban Assembly HS in Brooklyn, or the young farmers and entrepreneurs of the Youth Farmers Market and Learn It Grow It Eat It Programs (both run by Council on the Environment's Greenmarkets), or the Youth Caucus visiting from the Commission on Sustainable Development session at the UN. But one thing was for sure, young people are ever more aware of the social, economic and environmental challenges facing the world regarding agriculture, food, farming and nutrition... MORE"